My first quilt is now complete; a mini quilt that was originally for our quilt guild Madrona Road Challenge!!! I decided that it is, also perfect timing to take advantage of the Bloggers Quilt Festival, and live the experience first hand. 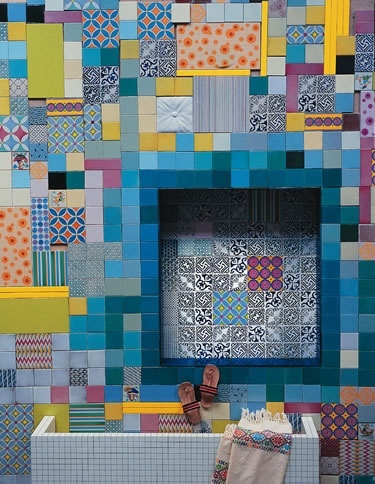 I loved the blue framing of the black and white tiled bottom of the bath (at least what looks like a bath). So taking that concept I came up with this quilt top using the madrona road fabric and a lot of blue kona cottons, and a splash of yellow and a single crimson tile. I machine bound my quilt in navy. 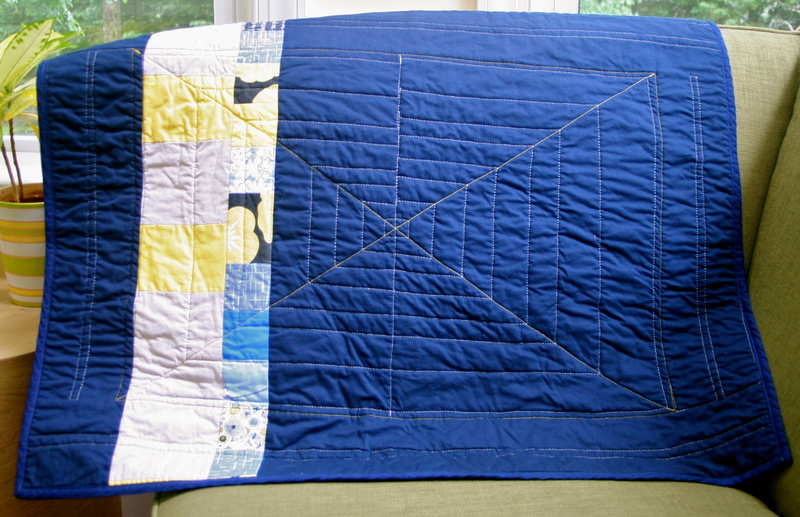 I love how the darker edge makes the rest of the quilt pop and also pulls out the darker blue prints. The backing consists of navy blue kona cotton, with a stripe of Madrona road blocks and a stripe of ash grey and yellow solids. The stripes were made from scrapes left over from the front and I improvised the piecing. I kept the quilting relatively simple. 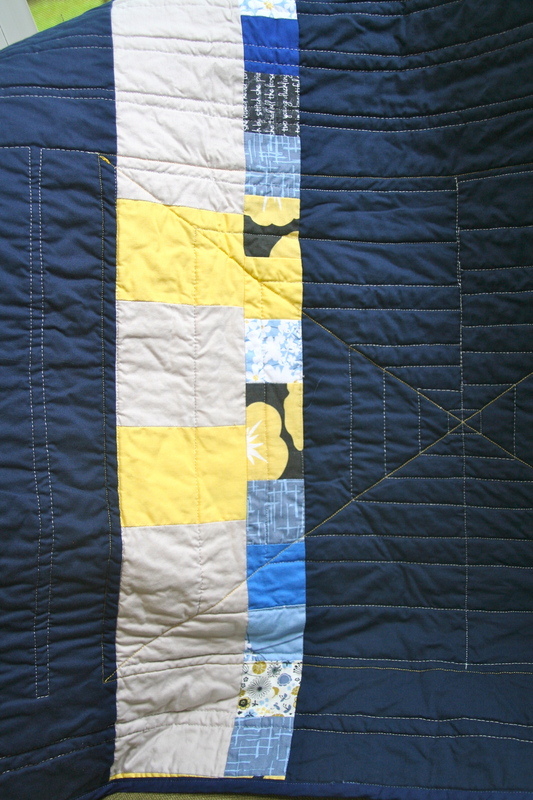 To highlight the blocks, I used yellow cotton for the edge and diagonals of this section (see above the details). I then used light grey cotton to quilt rectangles from the center to the diagonals in a web like radiating pattern. The blue tile framed edges I just used lines to highlight the rows – again in light grey cotton. I hope to add new photos once it stops raining here :-). 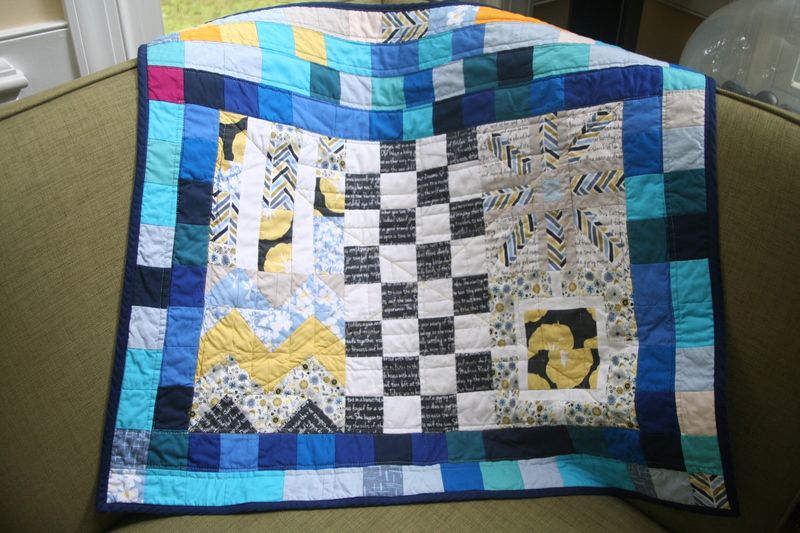 This entry was posted in Uncategorized and tagged ash grey, bloggers quilt festival, blue prints, blues, brother sewing machine, crimson, gold, Kona Cotton, Kona cottons, madrona road, mini quilt, navy blue, patchwork, quilting, sewing on May 21, 2013 by mlwilkie. Yay! This is beautiful. Love the navy, the text blocks, and that delicious purple mixed in. Such a wonderful finish! Congrats! Neat!! Great translation from your inspiration to fabric! There are so many pieces, parts and patterns. Yet there is something so beautiful and calming and fun about it. 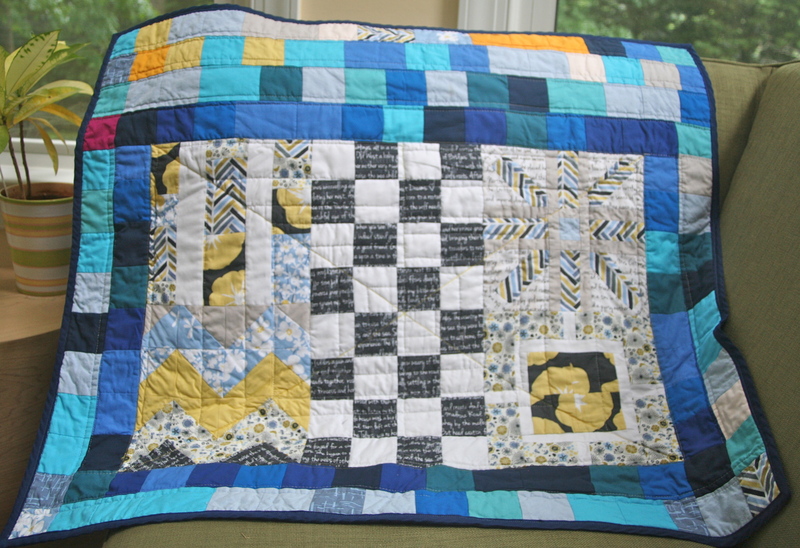 I like all the blues around the edges and especially like the way you used the chevron fabric in the star part. I also like the quilting. Great job! congratulations! It looks great, I’m totally impressed! Thanks – I still need to stop by….which actually should be today. Congratulations!! I definitely see the inspiration photo in your finished quilt. Your little red “tile” is so great. I also really like the spiderweb quilting, especially on the back. Well done! What a great inspiration and what a beautiful quilt. Well done! It’s so so pretty and special. Such a cool interpretation! Looks great.